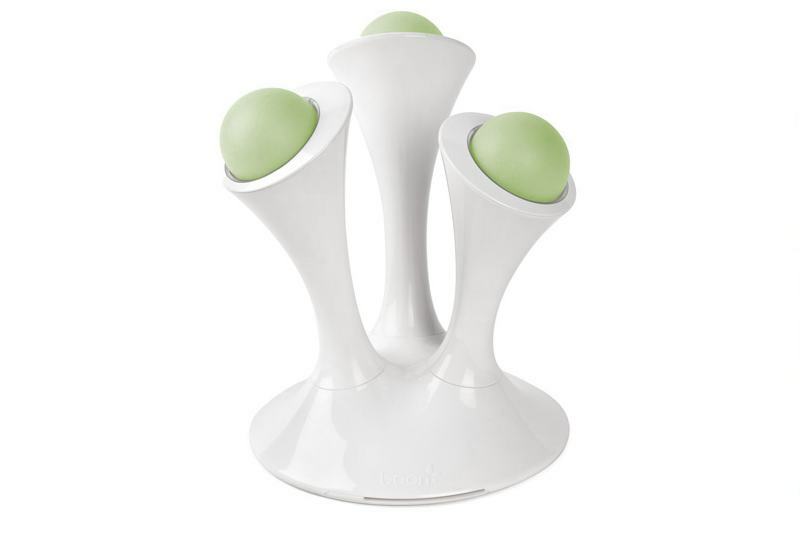 Fresh for spring 2011 comes a hot new Glo Nightlight from Boon. Streamlined and bright, these awesome new nightlights have one major perk — your kiddos will be eager to get to bed. Each Glo is an interactive nightlight with removable, illuminated Glo balls that shine in your child’s favorite color with an easy sliding lever, or your child can keep the colors circulating. Each portable Glo ball charges quickly on a low energy LED base. Like all Boon products, Glo is BPA-free, phthalate-free and PVC-free. Because there’s zero electricity involved, Glo won’t get warm, and there’s no need to worry about breaks either, so so a small game of catch the nightlight ball is a-okay. Glo is so safe you can even tuck it into bed with your child. The nightlight glow slowly fades to dark after 30 minutes, allowing your tot to fall peacefully into dreamland. + Glo – available Spring 2011! Boon Glo nightlight is illuminated with LED lights. Boon Glo lights up in different colors. The colorful glowing balls can be taking out of the base.